Offering you a complete choice of products which include pharmaceutical ampoule filling machine. We are being acclaimed in the international market as a trusted manufacturer and exporter of Pharmaceutical Ampoule Filling Machine. Our machines are used for labeling glass ampoule and vial in pharmaceutical and cosmetic industry. 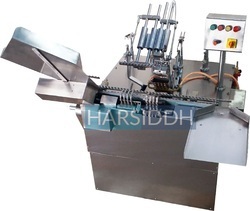 This Pharmaceutical Ampoule Filling Machine is made by a team of expert professionals using top quality materials, following the norms and guidelines laid down by the industry. These machines are in-built with an electrical sensing device and labels mechanical digital counter to provide continuous information of the total number of containers labeled.